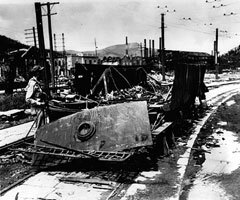 Like Hiroshima, the immediate aftermath in Nagasaki was a nightmare. More than forty percent of the city was destroyed. Major hospitals had been utterly flattened and care for the injured was impossible. Schools, churches, and homes had simply disappeared. Transportation was impossible. Many of the survivors—Hibakusha—have recorded their memories of those days. Fujie Urata Matsumoto, relates this scene: "The pumpkin field in front of the house was blown clean. Nothing was left of the whole thick crop, except that in place of the pumpkins there was a woman's head. I looked at the face to see if I knew her. It was a woman of about forty. She must have been from another part of town - I had never seen her around here. A gold tooth gleamed in the wide-open mouth. A handful of singed hair hung down from the left temple over her cheek, dangling in her mouth. Her eyelids were drawn up, showing black holes where the eyes had been burned out...She had probably looked square into the flash and gotten her eyeballs burned." Kayano Nagai remembers "I saw the atom bomb. I was four then. I remember the cicadas chirping. The atom bomb was the last thing that happened in the war and no more bad things have happened since then, but I don't have my Mummy any more. So even if it isn't bad any more, I'm not happy." Two years after the bombing plants growing at ground zero presaged the frightening genetic aberrations in humans that were to come: sesame stalks produced 33 percent more seeds but 90 percent of them were sterile. For decades abnormally high amounts of cancer, birth defects, and tumors haunted victims. Both Hiroshima and Nagasaki have memorialized the events of August, 1945 with museums, sculpture, peace ceremonies, and parks. They want no one to forget. The Nagasaki Atomic Bomb Museum states, "The question of how to inform young people about the horror of war, the threat of nuclear weapons and the importance of the peace is therefore a matter of passing concern. 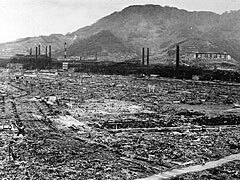 The citizens of Nagasaki pray that this miserable experience will never be repeated on Earth. We also consider it our duty to ensure that the experience is not forgotten but passed on intact to future generations. It is imperative that we join hands with all peace-loving people around the world and strive together for the realization of lasting world peace." Today, Nagasaki is a busy, industrial city with a population of almost 500,000. 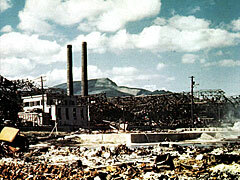 The Mitsubishi plant, so completely destroyed by the Fat Man bomb, now manufactures turbines and powerplants used around the world. The Enola Gay became a star exhibit at the National Air Fair in Chicago on July 3, 1949 and in 1952 MGM released the movie Above and Beyond about Tibbets and the Enola Gay, starring Robert Taylor and Eleanor Parker. The Enola Gay is on display at the National Air and Space Museum’s Steven F. Udvar-Hazy Center near Washington, D.C.
For years Sweeney and Bock’s Car were virtually forgotten. Bock’s Car was stored out of sight in the desert at Davis-Monthan field near Tucson, Arizona. Then in September, 1961 it made one more flight, to the U.S. Air Force Museum at Wright-Patterson Air Force Base, near Dayton, Ohio.